An army dressed in black, following black banners. Many of them not Arabs, and speaking languages that were not Arabic. Fiercely loyal to their Muslim faith and its leaders. Taking territory from the men who had brought Islam to them. Storming Damascus. Wielding blackened wooden clubs they called kafir kubat (infidel-bashers) against them. Digging up the graves of Umayyads to exact further vengeance on the dead. Appointing non-Arabs to positions once reserved exclusively for an Arab elite. Their invasion preceded by a long war of ideas from an extremely confident and competent propaganda machine. Their mission: to reform Islam by punishing those they believed were no longer good Muslims. To restore the religion originally preached by Muhammad. On the 25 January, AD 750, such an army was closing in on Marwan II the curly-headed, the last Umayyad Caliph, on the banks of the river Zab, a tributary of the Euphrates in northern Iraq. 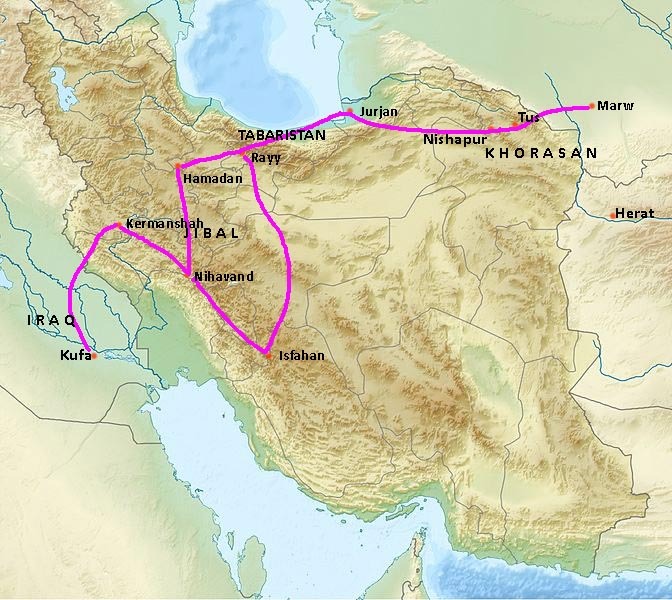 It began in Khorasan (Chorasmia), in the far northeast of the former Sasanian empire. Its population was mostly Iranian, although there were some Turks already living there. By AD 671, it had been fully conquered by the Arabs, and was controlled by a small garrison based in Merv (Marw). There were some Arab colonists - although living so far from the desert was not popular. Consequently, they were forced to recruit locals into the army - by 715 we hear of an army commanded by a first-generation Muslim from the Caspian area. By 740, the army was made up of the descendants of the reluctant Arab colonists, and their former Iranian "slaves" (mawali). All non-Arabs were originally thought of as slaves, whether technically so or not. Their way to escape and rise in society was to become a Muslim and join the army. Thus, 100 years on from the conquest, Khorasan was solidly Muslim, but partly Iranian in language and culture, with less now in common with fellow-Muslims and Arabs in far-off Syria. So it should not be such a surprise that when the revolution came, it was not against Islam. It had little to do with reviving past Iranian glories. It wanted to change Arab society itself by replacing the Umayyad rulers. There were several groups opposed to the Umayyads who thought they knew who Muhammad had wanted to succeed him (as caliph - the word just means "successor"). Gradually opposition crystallised around a movement which became known as the Shi'a or Shi'ites ("The Party" meaning the party of Ali). Muhammad had belonged to the dominant Quraysh tribe, and was a member of the Hashimi clan within the tribe. After the short reigns of the first two caliphs (successors), power passed to Uthman . He belonged to the Quraysh tribe like Muhammad, but to a different clan - the Umayyads (who had been enemies of the Hashimi back in Arabia). The Hashimi clan, led by Ali (cousin and son-in-law of Muhammad), believed that the Umayyads had no legitimate claim to the caliphate, and that the Hashimites, the Prophet's family, should therefore have a monopoly on it. Ali, not Uthman should have been the third caliph (some Shi'a believed that Abu Bakr and Umar too were usurpers). 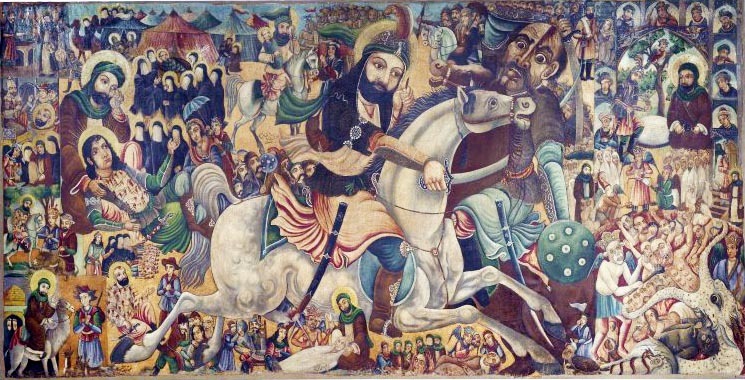 The Battle of Karbala by Abbas al-Musavi, c 1900. Brooklyn Museum (Wikimedia). Uthman's weakness encouraged rebellion, and when he was murdered in AD 656, it seemed that Ali's turn had come at last. The Umayyads opposed him, but he was for the moment victorious over them - establishing his authority over Iraq - and moving his capital from Medina in the Arabian peninsula to Kufa on the Euphrates - close to the capitals from which the Seleucids, Parthians and Sasanians had ruled the Persian empire. The Umayyads fought back - and outwitted Ali, forcing him to halt his attack by the ruse of fixing Qurans to their spears - as if to let Allah decide the winner. Thousands of his disappointed supporters deserted to found their own movement - becoming known as the Kharijites ("Defectors" who believed the caliphs should not be hereditary at all - neither Umayyad nor Hashimi, but someone with an irreproachable life chosen by Allah). When in AD 661, Ali was murdered by a Kharijite, the Umayyads seized power, and Muawiyah became caliph - Ali's elder son Hassan was persuaded to renounce his claim, but his younger son, Husain led an army against Muawiyah. He was defeated at Karbala in Iraq in AD 680. According to Shi'a accounts the battle was followed by a massacre, and Husain was beheaded. Ali's tomb at Najaf and Husain's at Karbala (both in modern Iraq) are still two of the holiest shrines for Shi'a Muslims. The Shi'a established their rival form of Islam, governed by a succession not of caliphs but of Imams, descendants of the Prophet through his Hashimi clan. All revolutions have two phases: preparing the ground (incubatory and clandestine phase: may take a long time), violent and militant phase (may happen rapidly). The basics of preparation are simple: undermine the credibility of the current regime; create expectation of something far superior to replace it. The Abbasid revolution gestated over two generations - formulating an ideology and the methods to sell it to as many people as possible. The first task was to insist on an (imagined) unified beginning to Islam - chiming with the concept of one God and one Prophet. Hence the Umayyads were illegitimate usurpers, and Islam must return to that ideal time when the rule of the Prophet's divinely selected family was unquestioned. This had been the position of the party of Ali (Shi'a), which had unsuccessfully challenged the Umayyads on numerous occasions: the most recent being the abortive rebellion of Mukhtar in AD 687, which ended in horror and total disaster for the Shi'a cause. After this, the Shi'a divided: the most significant faction being the Hashimiyya. They had supported Mukhtar's revolt, but after his failure, they decided there were better ways to go forward. A rigid chain of command pledged to secrecy was created - Muhammad ibn Ali, from the Abbasid family took over the leadership. Muhammad's claim to legitimacy was his descent from the youngest uncle of the Prophet, Abbas ibn Abd al-Muttali. Like the Alids (descendants of Ali), the Abbasids were also of the Hashimi clan of the Quraysh tribe. After initially establishing a base of support in Kufa in Iraq, he moved to Khorasan, to distance himself from the other Shi'a with, as he saw it, their suicidal propensity for unplanned rebellion. Khorasan was virgin territory uncluttered by any traditional loyalties, and, unlike Syria, Iraq and Hejaz, unexploited by any previous political movements. It was also a frontier zone, home to warriors, colonists who had migrated from Iraq, which had always been hostile to the Syrian Umayyads. Khorasan would be their power-base and their source of troops, despite being ruled by an Umayyad governor with his own forces loyal to the caliphate in Syria. The dawah (call) was for dawlah (revolution): a return to the perfect order of the time of the Prophet, and an end to the tyranny of the Umayyads. The Abbasids clandestinely spread the idea that a revolution was coming with the new century - when a new (unspecified) member of the Prophet's family would lead Islam into a new order for the rest of time. The Muslim year was approaching 100 (around AD 720). Muhammad ibn Ali assumed the title of Imam - used in the Quran to mean a perfect leader. The Imam was to be both temporal and spiritual leader. Secrecy was vital. He communicated only with 12 top leaders (the nuqaba, disciples. Four were mawali, the rest Arabs), who spread the message to missionaries throughout the region (the duat) who for 25 years with immense efficiency preached the Abbasid message: the Umayyads were corrupt, and a new leader (Mahdi) was coming. An undercover army, composed of disaffected Arabs but including many Iranians, newly-recruited to Islam, was gathering. Everyone of course assumed that this leader would be a descendant of Ali - the Abbasids were happy to encourage this, while keeping their own ambition secret. It took yet another failed Shi'a rebellion (in Kufa in AD 740) for the community in Khorasan to turn to an alternative descendant of the Prophet to avenge their humiliations and usher in the new era. Finally the Abbasids could reveal their hand: the movement was no longer focused on a descendant of Ali. The Shi'a accepted that only an Abbasid was fit for the task. The actual identity of the new leader, however, was still kept secret. When Muhammad ibn Ali died, his son Ibrahim became Imam. It was time for the second, military, phase of the revolution. Ibrahim's inspired choice to lead it was Abu Muslim - a man of obscure origins, who within a year had established himself as unchallenged leader, and his well-trained army in Khorasan was ready for action (AD 747). Beacons were lit across the region. The date chosen was September 11 (9/11). 10,000 warriors from all parts of Khorasan (though only a minority would have known about the Dawah, the true mission of the army) began to assemble at the rallying point - a fearsome sight in their black robes and headgear, riding horses and donkeys, with their black banners and blackened clubs they called kafir kubat ("infidel bashers"). But this was not to be just another rebellion: Abu Muslim already had detailed plans for the new government that would replace the Umayyads once victory was secured. Abu Muslim's army was not yet supreme even in Khorasan - but he cunningly encouraged his rivals (who also opposed the Umayyads) to weaken each other by fighting among themselves, until - through propaganda and diplomacy - most were ready to join him. The Umayyad governor of Merv (Nasr ibn Sayyar) was under pressure and increasingly distracted . At the same time, the Umayyad caliph, Marwan II was facing trouble nearer home. When Abu Muslim attacked Merv, the seat of Umayyad power in Khorasan, Nasr fled. An Arab from Khorasan, Qahtaba ibn Shabib was appointed general - and Abu Muslim was ready to move his army westwards. The further it advanced towards Iraq, the bigger it became: numbers, leadership, religious indoctrination and careful vetting of recruits, good financial support - and above all deep motivation and ideological conviction made Qahtaba's force a formidable power. Abu Muslim stayed in Merv, from where he continued to assert his power. Qahtaba's first success against Umayyad troops was an easy one, at Jurjan (Gorgan), which had been sympathetic to the cause from the beginning. Another stroke of luck was the death of Nasr, who, despite being 85, had continued to organise brave resistance. Tabaristan - not yet incorporated in the Arab empire was persuaded to stay neutral, and the army advanced to Rayy, where they spent the winter consolidating. The Umayyads had already withdrawn their forces to Hamadan (once Ecbatana). Marwan realised he needed to do something, but it was already too late. Qahtaba's son Hasan took Hamadan, forcing the Umayyads to rally at Nihavand - where Hasan besieged him. Qahtaba himself moved to crush the large army now at Isfahan - which had been sent against a different - and as it turned out - much less dangerous rebellion. In March 749, Qahtaba routed the best Syrian troops of the Umayyads in a decisive victory at the battle of Jabaliq., near Isfahan. Conquered territory was immediately and efficiently organised by the administrative genius of Khalid ibn Barmak. Qahtaba could now deal with Nihavand. The city held out for two months - until Qahtaba acquired catapults: it then surrendered quickly (June 749). The road to Iraq was now clear. Iraq had long been a centre of opposition to the Umayyads which the Abbasids had done much to exploit: sympathisers to the cause now began to rebel openly. Qahtaba advanced to Kermanshah. A victory over a small detachment of the Abbasid army (the only Umayyad success) seems to have encouraged the Caliph Marwan II to intervene personally. But when his forces were defeated at Shahrazur (August 749), he fell back to a position on the river Zab, where he prepared to make a final stand. "He thought the war would last a long time". But it didn't. He lasted four months. Qahtaba outflanked the Umayyads through clever disinformation, and his army captured Kufa, capital and beating heart of Iraq - although the great general himself was killed in an accident during the crossing of the Euphrates. Abu Salamah - secret leader of the local activists in Kufa - now took charge, as had been planned. It was time for the new Imam to be revealed at last - and take possession of his conquests. But where was he? Over two generations, the Abbasids plan and carry out a plan to replace the Umayyad dynasty. Conversion: Mawali - non-Arab Muslims. As well as actual former slaves and freedmen, the peasantry was very keen to convert and thus avoid the poll-tax or jizya imposed on non Muslims. The Arabs and the first-generation Muslims were initially unwelcoming - seeing them as "economic migrants", and many were refused entry or expelled. But in the end, Islam, because it was a religion open to all (that was its appeal!) could not exclude the peasants from its privileges. And so its armies became increasingly made up of non-Arab Muslims - contrast this with the attitude of the Romans, and later Europeans to their subject peoples. Even if admitted to the army, they could only very exceptionally actually become Roman, or French or English. But in the eastern part of the Umayyad empire, non-Arabs became not only Muslims, but full members of the community of Islam. The leading Arab tribe in Mecca claimed descent from Abraham via his son Ishmael. The sons of a common ancestor, Hashim and Umayya quarrelled and fell out in a major way, and the Hashimites and Umayyads remained bitter enemies. Muhammad was the great-grandson of Hashim. This ancient split was ultimately the source of the Sunni/Shi'a conflict. The Arabic word means "a turn": it was the turn of the Hashimiyya to replace the Umayyads: but there would be no subsequent "turns", as the ultimate ideal was now reality. After the Abbasids the word came to mean "dynasty" and eventually "state". Hence its use by al-Dawlah al-Islamiya (commonly abbreviated to Da'esh) aka ISIS/ISIL. The leaders travelled always in disguise - and made their plans when they met up on the hajj (pilgrimage) at Mecca. Sources are so contradictory that one must assume that no one actually knew where he came from! Was he a Persian (perhaps descended from the Sasanians), or an Abbasid, an Alid? Or a Yemeni, a Kurd or a Tajik? He was given the name Abu Muslim by the Abbasid Imam Ibrahim when he met him in Mecca during the hajj. Abu Muslim enrolled his soldiers without reference to their tribe - welcoming Arabs and non-Arabs (mawali) equally. This was a major step in reducing the Arab predominance in the caliphate. All were paid the same. by Khalid ibn Barmak: the first of his Persian family to gain attention. The Barmakids became hugely influential viziers to the Abbasid caliphs. Site of the battle in AD 642 between the Arabs and the Sasanians (the "victory of victories"), which had opened up the Iranian plateau to Arab conquest. It controlled the passes into Iraq.